“We haven’t got good management”. They “toured the world and elsewhere” to quote the legendary David St. Hubbins of Spinal Tap, but these sad-sack rocker pioneers Anvil don’t have much to show for it. While they and contemporaries AC/DC, Ozzy and Van Halen once blew out eardrums at the Monsters of Rock, the rest remain perennial arena draws and Anvil…well, Anvil is invited to…The Monsters of Transylvania (attendance, 200). 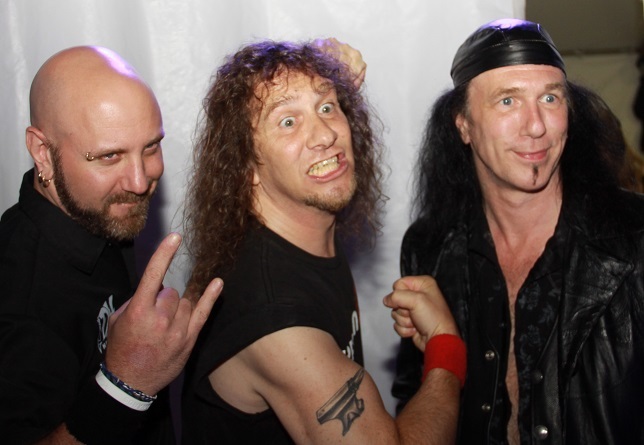 Anvil: the Story of Anvil, follows “Lips” Kudlow and Robb Reiner (not to be confused with the Tap director), two Chosen People head-bangers like KISS’ Simmons and Stanley minus the fact they haven’t sold enough albums to abandon menial side-jobs in the industrial hinterlands of east Toronto. Under the watch of their foul-mouthed Italian manager, Anvil rocks half-empty nightclubs in Eastern Europe, only to get into a physical spat with a bar owner that results in a paltry 100 Euro payout and offers of complimentary goulash instead. And this, while being ferried to gigs that aren’t too dissimilar from the sports bars the band rocked back home. After only lasting a few hours and realizing chunky down-picked metal riffing is the only thing he’s qualified to do he turns to his older sister for help. Then, in a touching scene, she keeps the dream alive of her indefatigable musician brother and percussionist childhood buddy by financing their comeback. Slash, Lemmy, Lars are among metal luminaries citing the band as an early influence, while Anvil pins their hopes on an indifferent EMI. Luckily, the release of the doc brought them the recognition and money they richly deserved, briefly lifting what one critic described as the “pall of middle-aged gloom hover [ing] over the antics of Canada’s longest surviving death metal band.”.